So, your cat just had surgery. Or your dog has been licking himself incessantly, creating a hot spot. 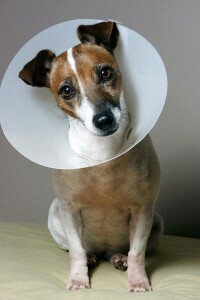 Your veterinarian emphatically recommends that Fluffy/Fido wear an Elizabethan collar (E-collar) to allow the incision/wound to heal. 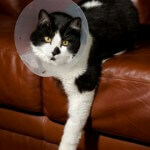 You think Fluffy will freak out and hide all day with the E-collar on. 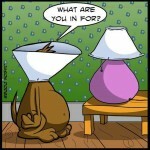 Or that Fido can’t walk, eat, sleep or otherwise function with his new lampshade. You respect your veterinarian and think she’s great, but just don’t want to subject Fluffy/Fido to the humiliation of an E-collar. Here’s why it’s worth it! 1.) Dogs, and sometimes cats, will obsessively lick and chew surgical incisions. They can chew out sutures and staples, and cause an infection to set into the surgical site. Even worse, some animals will chew out their skin sutures, then the subcutaneous sutures (those under the skin), and even sometimes chew through the sutures deep in the abdominal wall. If this happens, the incision can open up, and the entire contents of the abdomen (intestines, colon, etc.) can prolapse out of the belly and onto the floor. I’ve seen this happen, and it requires a second aggressive surgery to repair things. 2.) Dog and cat saliva does not heal wounds (see my other blog post “Veterinary Fact or Fiction” for more on this.) The more our pets lick themselves, the more they can cause hot spots to form, and infection to set into the skin. Scratching aggressively can also cause serious wounds. 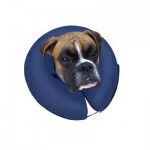 E-collars can be used to prevent scratching about the head, neck and ears and licking behaviors elsewhere on the body. Hot spots can become a vicious cycle of licking and scratching, so in order for things to heal, we often need to stop the pet from self-trauma. 3.) Fluffy and Fido can absolutely walk, eat, sleep and otherwise function totally normally with an E-collar on. It is most essential that pets wear their E-collars at night, since family members are sleeping and unable to prevent the unwanted licking or scratching behaviors from happening. 4.) 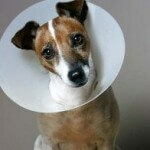 E-collars are only a temporary measure to allow incisons and wounds to heal. A few days/weeks of inconvenience for Fluffy will ultimately allow her to heal faster and prevent surgical complications. And it will save you a humiliating trip to the vet when Fido has chewed out all her spay sutures, and now has an incisional infection. 5.) There are a variety of E-collar type options now available. In most cases, the traditional hard E-collar is needed, especially for abdominal incisions or wounds on the feet. Dogs and cats can work their way around the inflatable and soft E-collars to get to their face and feet, so we only recommend hard collars for problems in these areas. However, the inflatable and soft E-Collars can be used for wounds over the back, neck, and tail. Talk with your veterinarian about which option may be best suited to your pet’s needs. 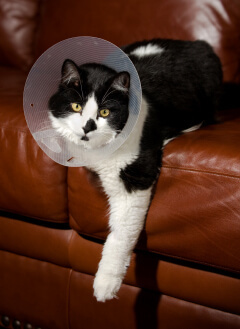 Most vets recognize that owners have significant reservations about putting an E-collar on their pet. Daily, I try to assuage clients’ concerns about E-collars and also convince them of their essential value. I wish we had better solutions to prevent Fluffy and Fido from licking their wounds. Fortunately (and unfortunately) E-collars are the best tool that has been developed for this problem. 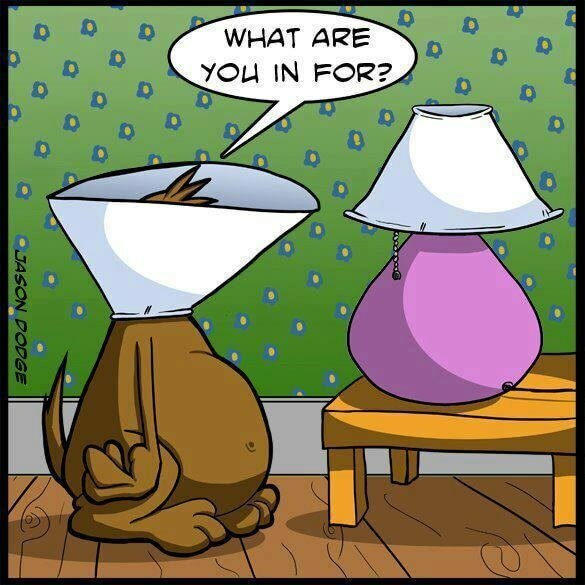 We want Fido to heal as quickly as possible and, sometimes, the best way to achieve that is with a lampshade on Fido’s head.